I've been looking at green monster recipes online recently (like this one), and was inspired by their bright green fresh look to create something similar. 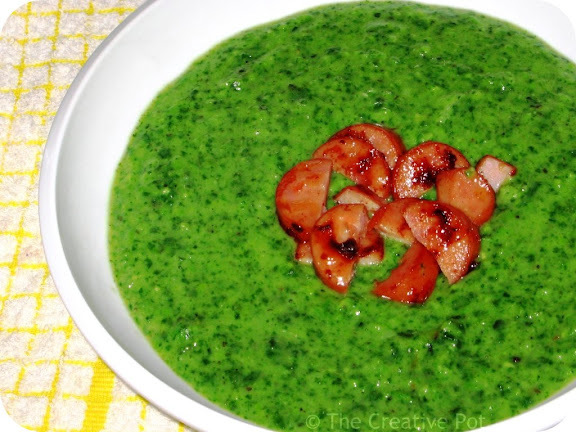 Unfortunately, it's not really smoothie weather here (and besides, the idea of spinach in a smoothie is still a little bit weird for me...), so I thought that a vibrant green soup would be the next best thing. And perfect for the drizzly grey day we had yesterday. 1. Place pototoes in a medium sized pot with a little bit of water and some salt & pepper. Place lid on and cook for 20 minutes until almost soft. 2. Add peas and cook for a further 5 minutes until potatoes are soft and cooked through. 3. Add spinach and cook a further 3 -5 minutes, until wilted. 4. Take off the heat and let cool for a few minutes, then blend to a puree with an immersion blender. 5. Place pot back on the stovetop, adding cream, milk, water and chicken stock. Re-heat for a few minutes until piping-hot. Add yoghurt, mint, sugar, salt and pepper to taste and stir through. 6. Serve immediately, scattered with some crispy croutons or bacon bits (or if you're like me and you just have some cheesegrillers on hand, fry them up in thin slices with a bit of sweet chilli sauce and use as topper). That is a green soup! Looks lovely, great colour - much better than the dull green pea soup I make. Thanks! The secret is in using fresh or frozen peas, instead of the normal split peas for the soup. OMG this sounds amazing, I have gong to have to make this right away!